Are you a huge metal head? Awesome! Then you must be familiar with the band Slipknot. This Grammy award winning heavy metal band is known for their insane stage presence and also for being a pioneer of the sub-genre known as Nu Metal. Show your fandom for this Iowa-based band with this Slipknot: Chris Mask! 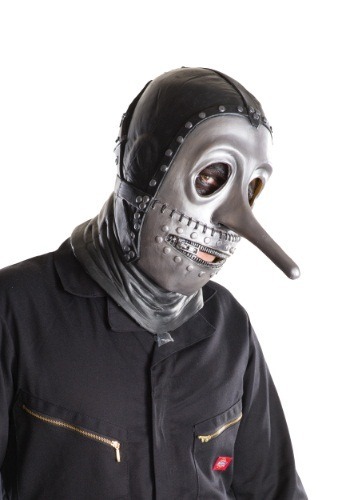 Born from the mind of Chris Fehn, this mask has a creepy Tin Man sort of thing going for it. So will you not have a heart or will you be searching for one? Either way, you'll look like you just crawled out of a small child's worst nightmare and are ready to hit the stage. Chris, or #3 as he is known in the band, is one of two custom percussionists in Slipknot. He originally just wanted to be a drum tech for the band before getting asked to join the madness. Then suddenly this powerhouse metal band had three different people playing various sets of drums! So if you're a huge fan or metal and you love to play percussion this haunting mask will be perfect for you. Grab yours now and start beating on some drums at your local music shop! If you are good enough people may even think that they're in the presence of the amazing Christopher Michael Fehn.